Step into a world of comfort and experience yourself the hospitality and comfortability of “Milyutinsky”, a modern hotel of the town of Cherepovets, Vologodskaya region, which began its work in February, 2014. 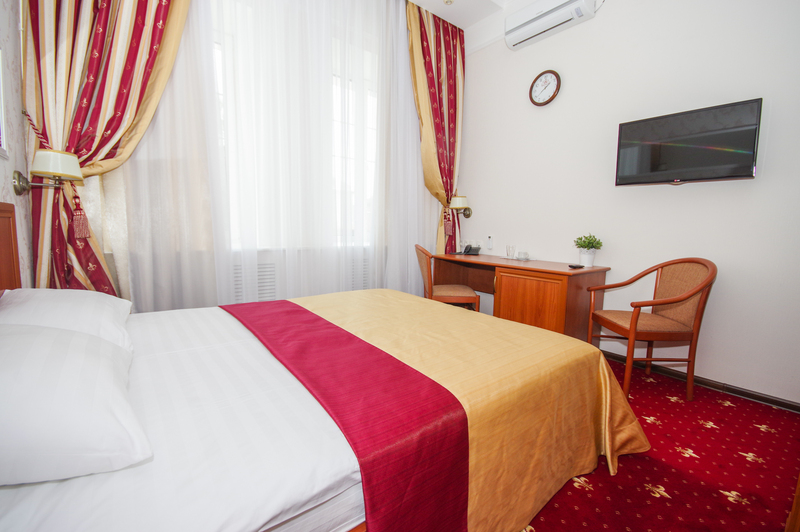 Strategically located in the historical center of the town, with Voskresensky Cathedral, Art Museum and Theatre at its doorstep, this hotel is ready to offer you a unique opportunity to explore the town or do your business at your convenience. It is also located within walking distance of the restaurants, shops, spa-salons, parks and waterfront. The hotel is constructed in a classic style, and its design is characterized by simplicity of forms and harmony. The walls are decorated with the pictures of Cherepovets of different historical periods, and reproductions of works of Vasiliy Vereshchagin, one of the most famous Russian war-artists, native of Cherepovets. Frescoes with brief information about the most famous and outstanding figures in town’s history add a touch of glamour to this place. I used to spend plenty of time travelling around the country and abroad. Frankly, not all the hotels I’ve been to I want to visit again. That’s why, while constructing “Milyutinsky”, I first of all was motivated by considerations of my own criteria of comfort and effective service. Every detail was taken into account, everything mattered to me. The hotel "Milyutinskiy" won "the best hotels in Russia 2014"
Each of the 12 “Milyutinsky” Hotel’s elegant guest rooms is air-conditioned, well-designed and meets all modern requirements and standards. 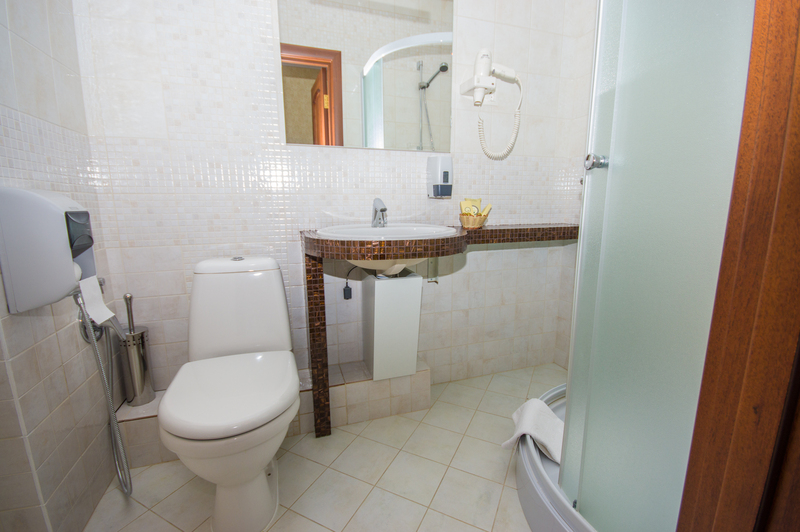 Rooms are equipped with everything that can make your accommodation here comfortable: electronic door locks, telephone, hygienic shower with complementary toiletries (slippers, bathrobe, hair dryer, shampoo and shower gel), free WI-FI, all-season hot water supply and a cooler with pure cold/hot water, SMART-TV with the free access to the Internet. 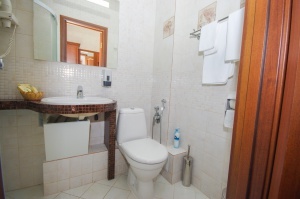 You can also enjoy having continental breakfast right in a room, which is complementary. Our guests are provided with a friendly service at the all-day-round reception, where our specialists are always ready to help you and provide you all necessary information. Free secure parking zone with CCTV (surveillance system) is also available for your vehicle during your stay. Single Standard: (for 1 guest), “Standard” category; 15 square metre,1 bed (90*200); this room features one bathroom (shower unit, bathrobe, hair dryer, towels, soap, shampoo and shower gel), desk, fridge, free wireless high-speed Internet access, SMART-TV system, telephone, wardrobe. 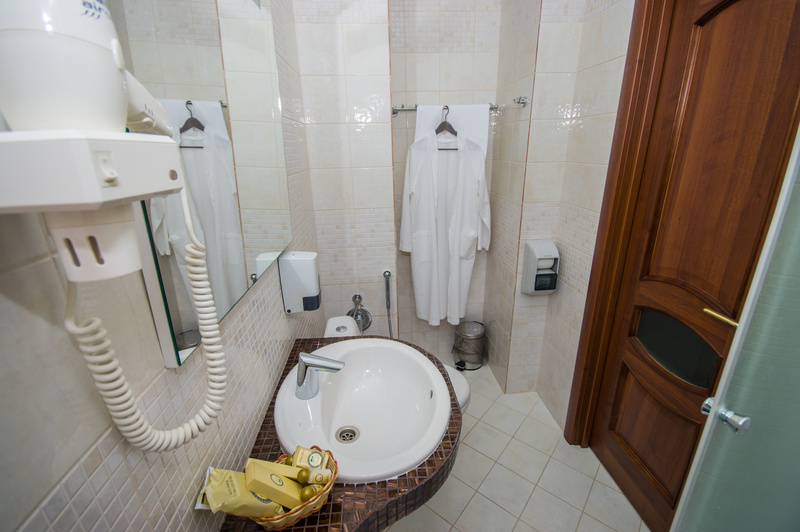 Price for one person per night: 3300 rubles. Single Comfort: (for 1 guest), “Comfort” category; 16 square metre, 1 bed (120*200); this room includes air-conditioner, comfortable desk, wardrobe, free wireless high-speed Internet access, SMART-TV system (television with free access to Internet), telephone, bathroom (one with shower unit, bathrobe, hair dryer, towels, soap, shampoo and shower gel). Double Standard: (for 1 or 2 guests), “Standard” category; 20 square metre, 1 bed (160*200); this room includes comfortable desk for working, wardrobe, air-conditioner, refrigerator, SMART-TV system (television with free access to Internet), free wireless high-speed Internet access, telephone, bathroom (one with shower unit, bathrobe, hair dryer, towels, soap, shampoo and shower gel). Double Comfort: (for 1 or 2 guests), “Comfort” category; 24 square metre, 1 bed (160*200); this room includes comfortable desk for working, wardrobe, air-conditioner, refrigerator, SMART-TV system (television with free access to Internet), free wireless high-speed Internet access, telephone, bathroom (one with shower unit, bathrobe, hair dryer, towels, soap, shampoo and shower gel). Double Comfort Twin: (for 2 guests), 24 square metre, 2 beds (90*200 each); this room includes comfortable desk for working, wardrobe, air-conditioner, refrigerator, SMART-TV system (television with free access to Internet), free wireless high-speed Internet access, telephone, bathroom (one with shower unit, bathrobe, hair dryer, towels, soap, shampoo and shower gel). Our hotel offers to spend an unforgettable night in a cosy and comfortable room. Save the memories about the most exciting day in your life and book a room for a newly-wedded couple at a special price. In honour of the celebration our hotel offers you: one bottle of champagne, ice-cream, chocolate and fruits. Late check-out is provided (next day at 14:00 pm). You can also make a present for your friends and relatives and buy a “Newly-married couple room” certificate. Attention! For the guests accompanying a newly-wedded couple our hotel provides 30% discount. And now I see the results! Every day I can see the smiles of the guests and their acknowledgements. I can say that I am proud of the “Milyutinsky” hotel and, undoubtedly, recommend you staying here! For a newly married couple there is a special price. We guarantee that every review will be considered. Your reviews help us develop and update the hotel’s service. Shower cabin and equipment could be better, there were minor problems with taking shower. We are trying to answer most frequently asked questions. Write to us for more information. Free secure parking zone with CCTV (surveillance system) is also available for your vehicle during your stay. Smoking in rooms is forbidden. There is a special zone for smoking. Special offer “day-off charge” is available, if you book a room directly on the hotel’s website or by calling the administration. Accommodation for our young guests is free (up to 7 years-old). Café and restaurant is near the hotel within walking distance (50 metre). Check-in: 12:30 pm. Check-out: before 12:00 pm. If you plan to check-out after check-out time, you will need to pay for half a room night additionally. Early check-in reservation is available at a price of one room night. In case you have not reserved an early check-in, but your room is already available, you can pay for the room before checking-in time in accordance with charge rate. The “Milyutinsky” hotel, undoubtedly, is one the best hotels in the town of Cherepovets. 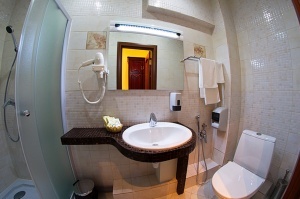 Be sure, if you choose “Milyutinsky”, you will enjoy comfortable accommodation and high-quality service.